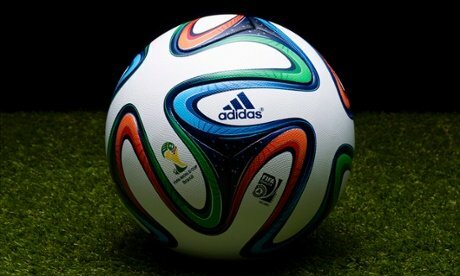 FIFA has unveiled “Brazuca” – its official match ball for the 2014 World Cup in Rio de Janeiro. The official match ball made by Adidas was named “Brazuca” in 2012 following a public vote in Brazil which involved more than one million fans. Brazuca’s design is said to be “inspired by vibrant colors, passion and heritage of Brazil”. Its name is a term used by natives of the country, meaning “Brazilian” or to describe the Brazilian way of life. The ball was unveiled during a spectacular 3D event held at the iconic Parque Lage in Rio de Janeiro, but went through a rigorous two-and-a-half-year testing process which involved more than 600 of the world’s top players. Players such as Lionel Messi, Iker Casillas, Bastian Schweinsteiger and former France international Zinedine Zidane were all involved in the process and have since signed off on its use for next year’s World Cup. Adidas say the technology used will “meet and exceed all FIFA metrics” and will “ensure top performance for every condition”. “A new structural innovation with a unique symmetry of six identical panels alongside a different surface structure will provide improved grip, touch, stability and aerodynamics on the pitch. Brazuca has been thoroughly tested to meet and exceed all FIFA metrics for an official match ball, ensuring top performance for every condition,” an Adidas statement read.